When you feel overwhelmed by the everyday life and have no time for house cleaning, what you can do is search for house cleaning services. In this day and age, it’s perfectly normal to hire a house cleaning service in Cypress, TX when you are unable to clean the house yourself. You might be wondering whether there’s a professional cleaning checklist that the expert cleaners use to clean your home to perfection. All cleaners have their special techniques and methods, which helps them excel at their job. 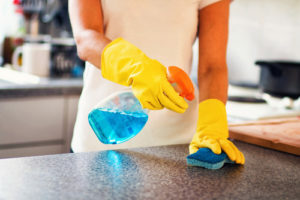 There are numerous benefits to hiring a reliable house cleaning company, such as having a clean bathroom or spotless living room without doing the work yourself. Here’s what else you need to know. When you hire someone to clean your house in Cypress, you might wonder if there is something you should do beforehand to prepare for such services. Although the cleaners are there to clean your house, you can and should make that job easier for them, especially if it’s their first visit. Start by decluttering, because you have hired someone to clean your house, not organize it. Make your bed and move any clutter out of the way so every part that needs cleaning is easily accessible. Move anything fragile and disposable and everything the cleaners aren’t in charge of themselves. Wash the dishes and put any leftover food away so the house cleaner can have clear table tops and sinks to take care of. You can also clear the everyday stuff from your bathroom so there is enough space for scrubbing and other services you’ve booked. When you hire someone to clean your home, the extent of the services they provide depends on what you agree upon when contacting them. You are looking for a completely clean house, which will be healthy and hygienic during all seasons and that’s what you should ask for. You can hire someone just for a one-time cleaning service or opt for a long-time arrangement with scheduled cleanings. Typical cleaning service includes cleaning the kitchen, bathroom, living room and bedroom. It can mean mopping the floors, scrubbing the tiles, wiping dust and vacuuming. It can also include wiping windows, cleaning cobwebs and scrubbing stairs. Deep cleaning includes more in-depth tasks for cleaners. All of this should be detailed before the job starts, so there is no misunderstanding in what should be expected. The cleaners are there to help you out, but they are not in charge of all chores in your home. When you hire house cleaning services, you are letting a stranger into your home. It’s much safer to choose insured and bonded workers through a company which employs them than uninsured individuals. This will mean that many possible expenses are covered by their insurance. For instance, if something is damaged in your house or goes missing from it, you will be compensated. Also, if the cleaners get hurt while doing their job, the insurance will cover all medical costs. In these cases, it’s better to be safe than sorry. When you choose Big City Maids, you will get a reliable service with fully bonded and insured cleaning professionals. You can book any type of cleaning service with ease and we guarantee you will be satisfied with the results. Why spend your free time cleaning your house, when you can leave it to us and use it to relax at the Evergreen Park? Take a break and we will make sure your home is in top-shape after our services.